I used to think of George Soros as the ruthless trader that was responsible for Britain's Pound Sterling's exit from the European Exchange Mechanism in 1992. At that time, the value of the Pound against several major currencies, fell to its knees. I was stuck with some Pounds and painfully lost some money. 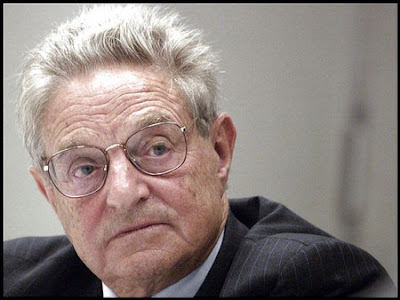 Later, Soros was accused by the former Prime Minister of Malaysia, Dr Mahathir for having designs to bring down the currencies of East Asia, following the financial meltdown in 1998. The Malaysian Ringgit suffered the greatest drop in exchange rates in all times. Both Mahathir and Soros have however called a truce and clarified their misunderstandings. I have heard about Soros' books and his Open Society Institute and Foundation, but didn't bother finding out any further. It was while waiting for a friend at Borders that I picked up "The Age of Fallibility" that I was really impressed with his sharpness and clarity of thought whilst analysing the various modes of thinking in societies, why open societies are important and how the Bush Administration has brought US global influence waning rapidly. George Soros regards open society as a reasonably stable society that holds itself open to innovation and improvement. Note that with this definition, a democratic society need not necessarily be an open one, though to become an open society democracy is necessary. 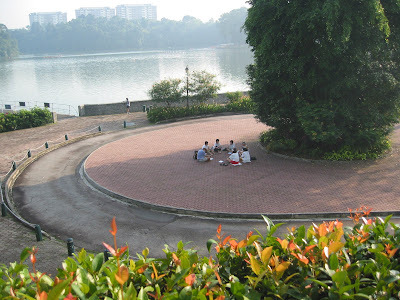 I think Singapore is an open society. Open as long as you don't try to bring down the government. Otherwise, it is very open to new technologies, new industries, foreign investors, foreign entrepreneurs setting up locally, foreign talent/labour, new languages (Mandarin and Singlish), urban renewal, casinos,...etc. However, he is against revolutions, as that will bring about changes too sudden that the majority of people will suffer. He espouse the strategy of supporting the intellectual elite in closed society, such that open society will thus have opportunities to germinate in the future when conditions become congenial. The following video clips will give you further insights into what open society constitutes and his Open Society Institute and Foundation's work in the newly democractic Central Asian republics. 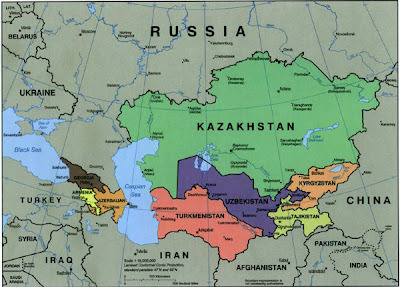 This is a map of Central Asia. They were formerly part of the Union of Soviet Socialist Republics (USSR). Soros commented that that his aim is to empower people living in the country to do whatever they can to promote open society. In January 2005, he called a meeting with Foundation directors from the Caucasus, Kazakhstan, Tajikistan, Krgystan and Mongolia. Soros started the Foundation 20 years ago, as he felt that he has enough money for himself and his family and that wanted to start something he really want, which is an open society. In an open society embraces critical thinking, democracy and the market economy. It is for people to get closer to the truth and improve upon conditions in life. Open Society initiatives started in Hungary, but soon spread to 60 other locations around the world. In Kazakhstan's north, there is this remote village called Daut, which has its school closed down after the furnace heating broke and it was -40C outside. School stopped, but the teachers brought the students to the railway station - as it was will heated. It was a hard time, so the Soros Foundation stepped in to help. Soon there was announcements of competition amongst the community school (for transparency reasons) to apply for grants for sewing and bakery. No computers or anything fancy was purchased. The school in Daut is the centre of community, if school is closed ,they will have no where to go. Workshops were built to teach sewing and woodwork, to impart useful skills. Project in Kazakhstan was a temporary one to establish foundations within that will get on by themselves later. Daut received their last $16,000 from the Foundation. Oil discoveries and development in Kazakhstan will bring in money for the country. The Foundation helps the government to spend the money in the right way in the right fields like education, health care and small business development; thus changing policies and making them universally popularly in neighbouring countries. In March 2005, a weak parliamentary elections sparked riots by angry crowds of people who stormed their White House where the seat of government is and turned it into a revolution. Soros is against revolutions as they are destructive and happens when conditions deteroriate to such an extent that people cannot put up with it any more. It is better to improve government gradually. Soros Foundation worked with the government for over a year to help to become more open to prevent violent upheaval. Governments must not regard the opposition as devils and vice versa. Soros Foundation started "Open Kyrgyzstan", a talk show among ministers, experts, businesses, NGOs and parlimentarians, two months before elections to debate and draft new laws. One of which is the deregulation of businesses. Government proposing law for one-stop shop to register business, otherwise plagued by corrupt bureucracy which costs time and money. Result is that many didn't bother and existed in the black economy. Interviews on the street conformed the findings. They invited an expert - a head of congress of business associations and director of a company to debate with the minister. Such talk shows ended up with recommendations for the government. This experiment to cooperate with the government is not without critics. Some didn't trust the Foundation. The Opposition felt that the Foundation should not work with the government - but this runs contrary to open society. Most remote and poorest of former Soviet Republic. Many go to Moscow to work to bring back money. Money brought back by migrant workers is three times the annual budget of Tajikistan. Main problem is residency permit in Russia, without which they are vulnerable to corrupt police officers. Russian law gives them three days to register, if not and if they are caught, they will be arrested and sent into 6 months detention together with common criminals. Migrant workers end up as street traders or in construction sites. One was worked for 11 months and the boss won't pay him and he has no recourse to the law. One Tajik mother came to Moscow to search for his son, who went missing after being a migrant worker. There was no news from him after 11 months. Even with the proper papers, migrant workers are harassed by the Russian police for money. They would accused them of carrying drugs or some offence they didn't do. One of them was confronted, the police took his papers, beat them up and took what they have. The woman who went to search for his son, was sent around different government ministries but to no avail. After the League of Women Lawyers helped her to draft a letter, she got a reply from the government that her son is not in prison, not wanted and not in the mortuary. Everyday bodies are returned home to Tajikistan. Last year there were about 1000 bodies returned hiome. The Foundation informs migrants of their rights and of where to contact them should they encounter problems. AIDS is very high occurence among migrant workers who return to Tajikistan, and by the time the villagers realise that, damages have been done. A 16 year old migrant waitress was forced into prostitution. The police came and arrested her, she was abused, humiliated and constantly raped, because the police knew nobody was going to raise complaints. Finally she was deported in a cattle train car that took five days to get back to Tajikistan. She was found to be HIV positive. The Soros Foundation cannot sort all these problems other than defending the migrants' rights. What is needed is a political solution between the two countries. On the last day of filming the documentary, word came back that the lost son of the lady died in a street brawl a year ago. Open Society is not a dogma that gives you the final answers. Open Society is an idea that nobody have the final answers and therefore must develop ways where different people with different views can live in peace and prosperity. 1. What touches you most in this documentary? 2. Do you think open society can exist in your country?